Tim has released two of the books that he has written, and you can order copies of these books below. These books are not being sold as a money making venture. On the contrary, any money generated from book sales goes right back towards covering the expenses of printing more copies of the books. There is even a third book that Tim has written that is awaiting printing. The goal of these books is to try to make good Bible teaching available to other people. These books are just a natural extension of Tim's teaching ministry recorded in written form. 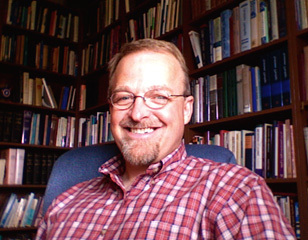 ABOUT THE AUTHOR: Timothy C. Hoelscher graduated from Dispensational Theological Seminary in 1989. Then, in 1991, Tim and his family moved to Royal City, Washington where Tim began pastoring First Baptist Church. Tim has served there ever since, teaching the saints faithfully from God's Word. GOD'S HOUSE PLANS (EXCERPT FROM BOOK'S BACK COVER): Two thousand years ago, believers regularly went to temple, offered sacrifices, and spoke with priests. In order to approach God's temple, God required people to observe rules governing their diet, washing, and personal relations. Now we are told that we can eat anything for which we give thanks. God's temple is no longer a physical building, but individual believers, and groups of believers. Today, all believers are priests. Why the changes? These changes can be understood by considering what God reveals to be house rules, or dispensations. These dispensations are related to the various ages, in which God has objectives for both us and His angels. Some of these dispensations also have ties to God's covenants. Understanding God's plans will affect the way we live, by helping us discern what parts of God's plans are for us. Paperback book, 219 pages. $15.00 (shipping included). A NOTE TO OUR INTERNATIONAL FRIENDS: If you live outside the United States, then please e-mail Tim (by clicking on the link at the bottom of the page), so he can let you know how much international shipping costs will be. Thank you. GETTING GRACE (EXCERPT FROM BOOK'S BACK COVER): How does God teach us about His grace? If not at first, eventually most Christians want to know how to live their life according to God's Plan. Grace summarizes God's Plan. At times, grace is clearly identified in the Scriptures. At other times, it is seen by what God has done, and by how He then calls us to live. Sometimes, grace is abandoned by the Christian, not intentionally but rather because many of us have failed to fully grasp the nature of God's Grace. And yet we must get it, we must understand the nature of grace, if we are to truly understand what God is doing by grace. Many have struggled and failed in their Christian life. Often, we are left wondering why it is so hard to live out the Christian life? Does God have a plan and design for our failure? If we understand grace, then where does sin and chastening fit into this design? These are some of the issues involving God and His Grace that are addressed in this book. Paperback book, 118 pages. $13.00 (shipping included). A NOTE TO OUR INTERNATIONAL FRIENDS: If you live outside the United States, then please e-mail Tim (by clicking on the link at the bottom of the page), so he can let you know how much international shipping costs will be. Thank you. THE SON (EXCERPT FROM BOOK'S BACK COVER): God the Son is a controversial figure. Various religions have made claims about Him. The claims of one religion may disagree with those of another religion. Yet even among Christians, opinions vary greatly about Jesus Christ. The Hebrew and Christian Scriptures, alone, detail Who He is, why He came, and what He did. Those Scriptures reveal that He is the sole means of salvation for mankind. Those Scriptures also reveal truths which can appear contradictory - He is God and He is man. Yet both truths are crucial to what He accomplished. To the surprise of many people, He has been active for all eternity, and remains active. This set of studies will consider His work in the past, present and future. It will examine what it meant for Him to become human, and what He accomplished by doing so. The Son is a deserving object of our worship , and subject of our study. Paperback book, 309 pages. $13.00 (shipping included). A NOTE TO OUR INTERNATIONAL FRIENDS: If you live outside the United States, then please e-mail Tim (by clicking on the link at the bottom of the page), so he can let you know how much international shipping costs will be. Thank you. If you have any questions about ordering books, then CLICK HERE TO E-MAIL TIM.